(ExWeb/Madrid) "We have done our part," Edurne told her home team at arrival in C4. "It's been tough, very tough - but it paid off in the end," she reckoned, sounding wasted and utterly happy at the same time. "Happiness is greater than exhaustion though," a relieved Joao told Aurelio Faria over the radio. The Portuguese recalled the climb to the summit had been fast up to 7,900m. 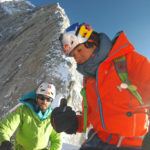 "Then we had to deal with a narrow ice couloir," Joao reported. "We had to carve small steps for progression." For that reason, the climbers didn't stay for long on the summit. "We've taken the necessary pics, and are heading down right away - descent is going to be dangerous," Garcia told BC from the top. 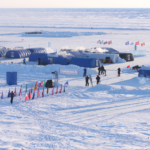 "The team needed four hours to climb back down to BC," Edurne team doctor reported. 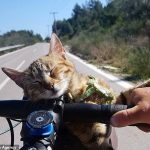 "They are exhausted and probably dehydrated, but otherwise healthy and very happy." 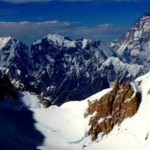 Tomorrow the climbers plan to cover the 3,000 vertical meters down back to BC. They will stop for lunch in C2 though; a Sherpa in Edurne's team hopes to reach the spot in time to greet the summiteers with food, fruit and coca-cola. 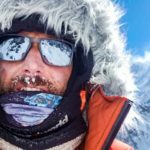 "Cooks in Edurne, Joao and Mingma expeditions are preparing for a summit celebration dinner," Aurelio Faria wrote. 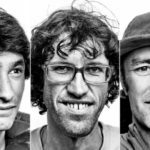 Update Apr18, 6:50am EST: All climbers are safely back, Edurne BC crew has just reported. They are all healthy and happy. Some amazing summit images are expected soon, as Joao team hired a B3 chopper to film his arrival to the summit. "The chopper is capable to reach 8,000m," journalist Aurelio Faria reported from BC. 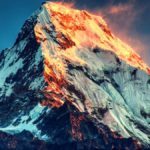 "However - due to a low pressure system in the area, the helicopter was forced to fly before the climbers actually reached the summit. The camera got some very cool footage of the climbers overcoming the ice couloir though." The summit team spent yesterday night in C4 and thus were unaware of the avalanche which swept the tents pitched there. The slide hit the tent where Xavi Arias and Lluis Rafolls were sleeping, missing them by inches. "Apart from some bruises on their backs, they are Ok," Edurne Doctor said. "After the slide, the climbers felt unsafe and returned to C2 right away. They are now back in BC, under supervision of Drs. Ramon Morandeira and Mª Antonia Nerín." 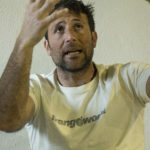 Juanito Oiarzabal and Tolo calafat had pitched their tent in a sheltered place which resulted undamaged; Carlos Pauner and Javier Perez were still on their way to Camp 3 when the avalanche fell. 1. 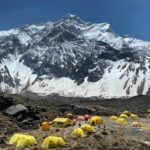 This was the earliest ascent ever of Annapurna on the season (the previous record was last year - April 21). 2. 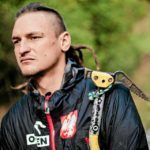 João Garcia is the 19th person to summit all 14, and the 10th without oxygen. 3. Edurne is the 7th lady climber to summit Annapurna, and the first lady climber from Spain. Edurne and her 13th 8000m+ summit: Annapurna. B3 chopper ready in BC to film Joao Garcia arriving on Annapurna summit.